Russia and the United States have agreed to work towards holding an international conference to find a political solution to the conflict in Syria. Foreign Minister Sergei Lavrov and Secretary of State John Kerry announced it would follow on from an Action Group for Syria meeting in Geneva last June. 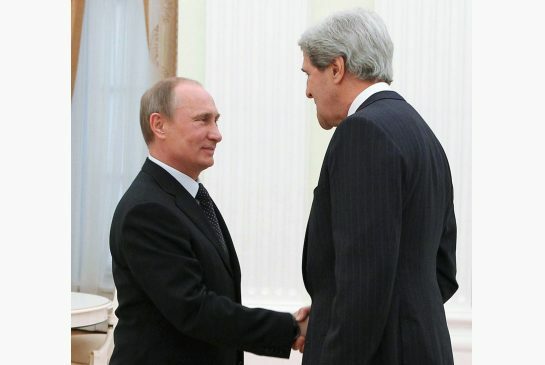 John Kerry said they would try to “bring both sides to the table”. Relations between Moscow and Washington have been strained in the last two years by differences over Syria. John Kerry held lengthy talks with Russian President Vladimir Putin on Tuesday during his first visit to Moscow since becoming secretary of state. He told Vladimir Putin that their two countries shared “some very significant common interests with respect to Syria”, including “stability in the region” and “not letting extremists create problems”. “It is my hope that today we will be able to dig into that a little bit, and see if we can find common ground,” he added. John Kerry then held further discussions with Sergei Lavrov, after which they jointly announced that they would try to organize an international conference on ending the conflict in Syria, if possible before the end of May. It will try to convince both the Syrian government and opposition to accept a solution based on the core elements of the final communiqué issued on 30 June 2012, after the UN-backed Action Group for Syria meeting in Geneva. The communiqué called for an immediate cessation of violence and the establishment of a transitional government that could include officials serving under Syrian President Bashar al-Assad and members of the opposition. “We believe that the Geneva communiqué is the important track to end the bloodshed in Syria,” John Kerry told a news conference. He added that a negotiated settlement would help avert the danger of Syria breaking up and might influence Washington’s decision on whether or not to arm rebel groups. Sergei Lavrov reaffirmed Moscow’s belief that the departure of President Bashar al-Assad should not be a condition for peace talks, but insisted he was not trying to keep him in power. “We are not concerned by the fate of any individual. We are concerned by the fate of the Syrian people,” Sergei Lavrov said.